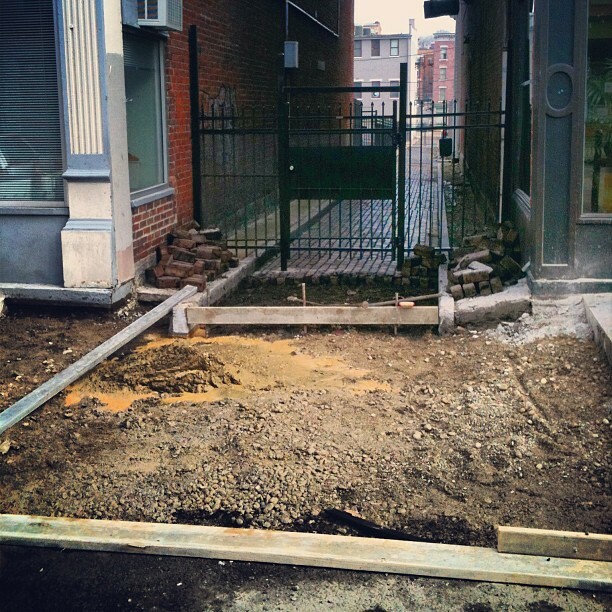 Walking through Over-the-Rhine and Downtown, you might have noticed construction at the outlets of alleys. Brick pavers that extend from the building envelope to the curb edge of the perpendicular street are being removed, while new bricks and concrete create a sloped surface. The current process has reached Grear and Goetz Alleys, on the block bound Main, East 12th, East 13th, and Sycamore. The sidewalk plane will extend across the alley without interruption, while the entrance to the alley will become a gradual ascension into the old city. This may seem like a recent development, but its origins date back more than 60 years. In a January 1948 feature article, in the Cincinnati Enquirer Pictorial Magazine, Watch Your Step! features a commentary on the lack of “flush sidewalks” that other cities had to-date. “We take 45 steps (count ’em next time you’re downtown), step down one, take three steps across an alley, step up one, and walk another 45 steps to reach the next street corner. Walk a mile in downtown Cincinnati, and brother, you have stepped up and down a lot.” It continue to describe the mechanics of alleys in Jackson, MI, where the slope into the alley delivered water into a catch basin. The water was piped into the storm sewer of the neighboring street, before it reaches the crosswalk. Three months after Watch Your Step! hit newsstands, the Times-Star reported on the Mayor Albert D. Cash’s filed motion to Council, which requested a study of alley walks in the downtown area. 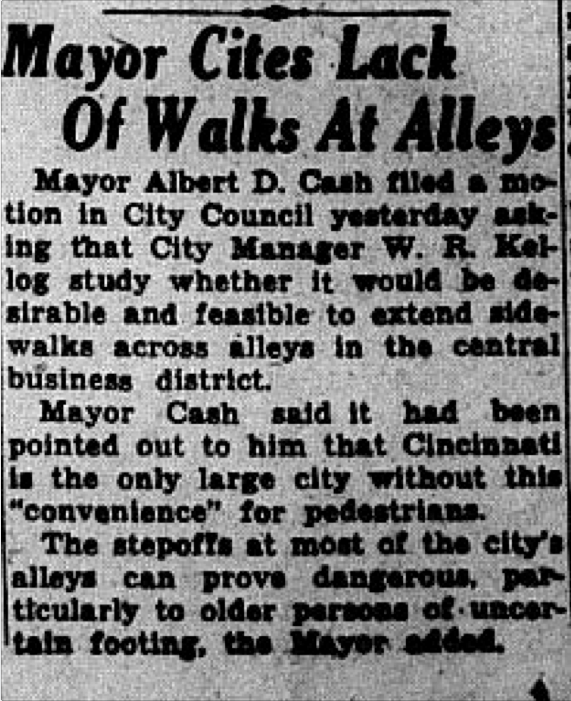 It seems that by 1948, “Cincinnati is the only large city without this ‘convenience’ for pedestrians.” He noted that lack of alley walks could be a hazard to the elderly. Certainly, in the era of ADA compliance, it only makes sense to make this move in the interest of a more walkable Cincinnati. Meanwhile, the beautiful granite or limestone curbs remain intact, after an alley walk remediation reaches completion. We encourage you to follow springinoursteps on Instagram, to get a regular dose of alley and stairway photos, including the latest modifications to our pedestrian paths. There will be a slope on both sides, right? I’m thinking of an alley perpendicular to main st near 12th…the sidewalk slopes down to the alley but not to the street which makes it awkward to enter on a bike and impossible for a car. Nate, it will function like a curb cut with a slope into the alley, and appear like a private drive does along a street. Visually, I could see it discouraging vehicular traffic, but I could definitely anticipate it being more inviting to a cyclist too. Incidentally, I was waiting for the bus on Clifton today when someone tried to enter the sidewalk at a driveway…his wheel caught on the two inch lip as he crossed it at an angle and he went down pretty hard…ouch! This entry was posted on February 18, 2013 by C. Huelsman in Alleys, Commentary.